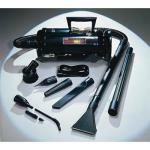 We have seen and tested other car vacuums and they just don't have the power or variety of accessories that this one has. This twin fan, 4 peak horse power vacuum is capable of an amazing 95" of water lift -the standard measure for a vacuum's efficiency (most manufacturers don't put this measurement in their literature). This compact vacuum is only 15 in long and 7 inches in diameter. Use it as a vacuum or as a blower to inflate rafts, air mattresses, or to blow away water after washing your car for the perfect scratch free shine. 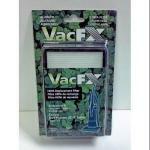 We have included every type of attachment you could think of so you can get into a crevice as small as 3/8in ! Not only is the vacuum perfect for detailing car interiors, but fantastic for cleaning up dusty computers, refrigerators, etc. 6 micro attachments to get into tiny crevices! Filter type is a reusable cloth dust bag. 110 volt with an 12 foot cord. Made in the U.S.A. 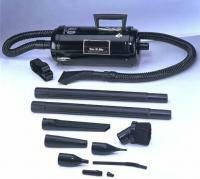 Simply the best, strongest pulling, super quiet vacuum available. A must have. "Love your site and your products. Thank you!" I work at Harvard University in the Piano Shop where we take care of over 200 pianos. I purchased the 4hp vac to clean pianos and it is the best we've ever had. 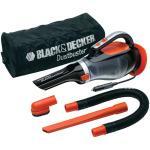 It has a powerful draw with lots of handy attachments makes getting the dirt out of awkward spots easy. I will probably buy one for my garage at home to clean cars.